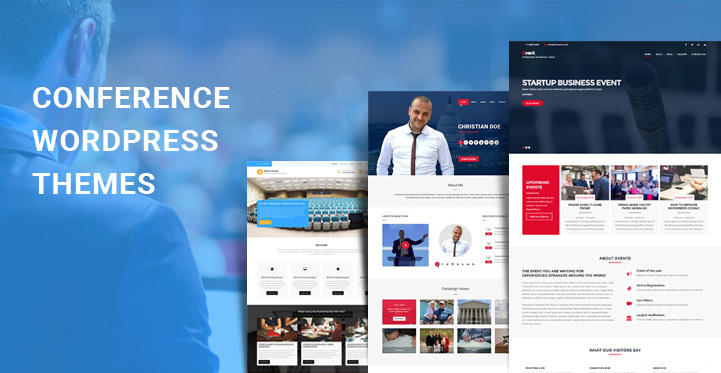 A list of the most practical conference WordPress themes for conference and event management, exhibitions and meetings, concert and projects, sports events and donation programs and much more. The businesses of all kinds, calibers and financial status have adapted to great changes in the last decades due to the information revolution and the rapid growth of the digital arena. Additionally, they have changed all the traditional ways of marketing, advertising, collecting the target audience in the right place or delivering their message to them. With the avalanche of the online possibilities and marketing strategies for absolutely any kind of business, the WordPress specialists always keep an eye of the trending topics and niches in order to generate the right templates for their users. This time our main focus will be on conference WordPress themes for conference and events related businesses, undertakings and projects online, professional conference and congress organizers, seminar moderators, event planners and other relevant specialists and activities online. Make more profit with less stress and turmoil around while going live with any of the conference WordPress themes you will find below. All of them are inherently customer driven and user centric while generating a thoroughly convenient and adjustable layout for constant changes and modifications. Moreover, with a little initial investment, you will be able to make your online workload much prolifically even while you have no coding experience or have never created a website on your own. Whether you are a manager of a big company and want to organize an online conference where all your specialist and workers will be present, or just want to offer your planning and event organizing services to your audience, Perfect Event is what you are looking for. From event and venue, conference and congress planning services to the organization of online meetings, trainings and public speeches, Perfect Event knows the best way to hosting all of them. Shortcodes based for keeping you away from coding processes, font and icons packed, this template is also wonderfully adjustable and responsive with mobile supportive nature to make your profile adapt to the size of the web user’s viewpoint. Political Candidate is serious looking and highly professional website tool included in our assemblage of conference WordPress themes. It is minutely worked out and developed to bring tons of advantages and controllable elements at your hands to use the given platform as per your wishes and needs. From political candidates and political campaigns to business events and conference management activities, social programs and donation fundraisings, any kind of relevant activity can be showcased with Political Candidate. Make all your programs, events and services available for your web users while practicing the given content areas. You can tweak to the admin dashboard of the theme and alter the initial structure of your site with more content categorization, new homepage slides, more shortcodes application, new colors and typography and more. Meet Online Coach Pro as an ambitiously potential and visually attention grabbing website building tool for conference and training organizers, coaches and tutors, artists and businessmen, marketers and developers to make their voice heard across the global digital world. As one of the most applicable and revenue generating conference WordPress themes, Online Coach Pro embraces a wide scale of noteworthy elements, features and characters to make your work as easy as possible. Fully widgetized areas are at your disposal for organizing your secondary content along with the primary one, commercial ready layout for running an online store and selling your products, services and more. In case you want to reap more profit from your profile, you are free to expand the working potential of your site while pairing it with event management and event calendar plugins. 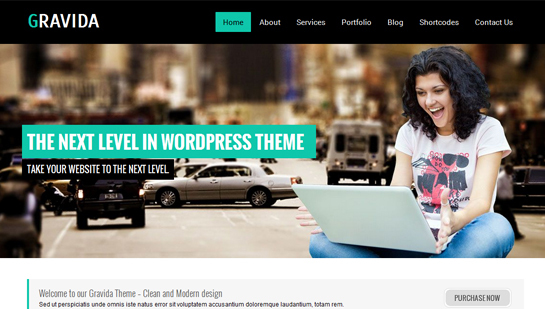 Strongly coded and stylized, modern and attractive looking, Gravida is one of the most dynamic and eye catchy event and conference WordPress themes to provide you with a real life experience. From making your planning and conference organizing services available for your clients to keeping strong relations with partners and investors, Gravida acts as a linchpin bringing all the possibilities and working strategies at one place. Integrate your site’s content areas with useful information, company profile, services and offers, event planning courses, conference venues and more, showcase the most influential images and photos in the homepage slider area. The theme has also been checked with other slides, commercial platforms and shortcodes when supported by relevant plugins and extensions. Religious is the next multifunctional and all inclusive website template for conferences and sports camps, religious and humanitarian events, fundraising campaigns, online debates, as well as for any kind of all day programs and events management. There are boundless inner management and customization possibilities with Religious, starting from color and font managements and choices to plugin compatibility and content translation, shortcodes based performance and customizer options. Let your website visitors find the events and programs, organize the conferences and meetings that fuel their passion and enthusiasm through your informative content. Keep everything well formatted and organized from the backend of the theme and make your site highly competitive in the battlefront. All in all, Religious delivers world class framework and low cost, thus, making the right choice of the best conference WordPress theme easier for you. Blendit is the next innovative and visually inspiring, technically mistake free and fully fledge event and conference related tool you can give a try. This responsive and user centric, highly flexible and intelligent template is ready to provide your web guests with smooth and sleek navigation controls, pixel perfect look and feel across multiple platforms and browsers, as well as presentable contact form to get in touch with you. From backyard events and family meetings to online trainings and conferences, events and programs, world festivals and film premieres, Blendit is never hesitant to house any kind of information and make it easy to digest for the potential clients.